Skyla Knight. Journal photo by Ingrid Howard. Skyla Knight prefers dishes to baskets. In other words, Hoover’s senior guard likes to dish out assists instead of scoring baskets. “Skyla is one of the most talented girls I’ve ever coached,” Hoover girls basketball coach Krystle Johnson said. “She has a high motor and plays with a lot of intensity. She’s a playmaker. She creates matchup problems all over the court. She can create for herself and everybody else. The unselfish Knight wouldn’t have it any other way. The 5-foot-7 Knight isn’t just a passer. She surpassed 1,000 points for her career in January and is averaging 13 points per game. 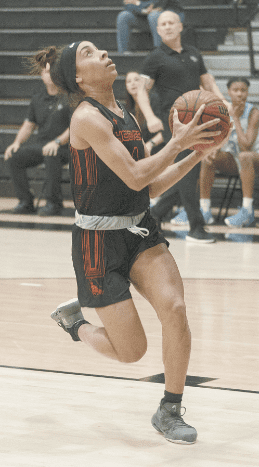 She also averages 3.0 assists and 3.0 steals, providing a bit of everything as the Bucs finished the regular season with a 28-1 record, following a 56-48 victory at cross-town rival Spain Park last Friday. Hoover will host the Class 7A, Area 5 tournament and take on Thompson Thursday at 3 p.m. The Bucs’ only loss was a 53-35 setback at Hazel Green on Nov. 16 in their third game of the season. They have a 26-game winning streak. That’s because of the way the 2018 season ended. Hoover did not lose to an in-state school until Sparkman dealt the Bucs a 55-54 setback in the Class 7A Northwest Regional final. Hoover finished the season with a 30-2 record but didn’t make it back to the state tournament after having won the 2017 Class 7A championship. Knight did not get to play on the 2017 championship team. She had to sit out her sophomore season after transferring from Spain Park because of AHSAA transfer rules. Her family had moved from the Los Angeles area to Hoover when she was in the eighth grade. “My mom, Victoria, works for Nike as a sales rep and she got a promotion,” Knight said. Although she was attending Berry Middle School, as an eighth-grader, Knight played on the Spain Park varsity team. She also played for the Jaguars as a freshman, but following that season she asked her parents if she could transfer to Hoover. “It was a personal decision, one I had to take in order to be successful the rest of my high school career,” Knight said. Johnson welcomed her with open arms. When Knight went to Hoover, so did her younger sister Jada. She’s a sophomore guard. “It’s a lot of fun to be able to compete with her in practice and play with her in games,” Skyla Knight said. So who wins when the sisters play one-on-one? “I do,” Skyla said matter-of-factly. Knight also has a 7-year-old sister, Aria, who plays in the Hoover recreational league. Knight isn’t only excelling on the court for the Bucs, but also in the classroom. She is enrolled in Hoover’s International Baccalaureate Program. “My dad (Delane) was the main reason I decided to take the IB program,” Knight said. “He wanted to push me in the classroom. My mom pushes me on the court. Knight also gives a huge assist to her parents. Her dad is originally from Chattanooga and her mother from Memphis. Knight has already signed with the University of Arkansas Little Rock. UALR head coach Joe Foley can’t wait until Knight starts dishing for the Trojans.